The haunting, mysterious Easter Island is a remote island in the middle of the Pacific Ocean that today, is surprisingly accessible from Santiago and Tahiti. 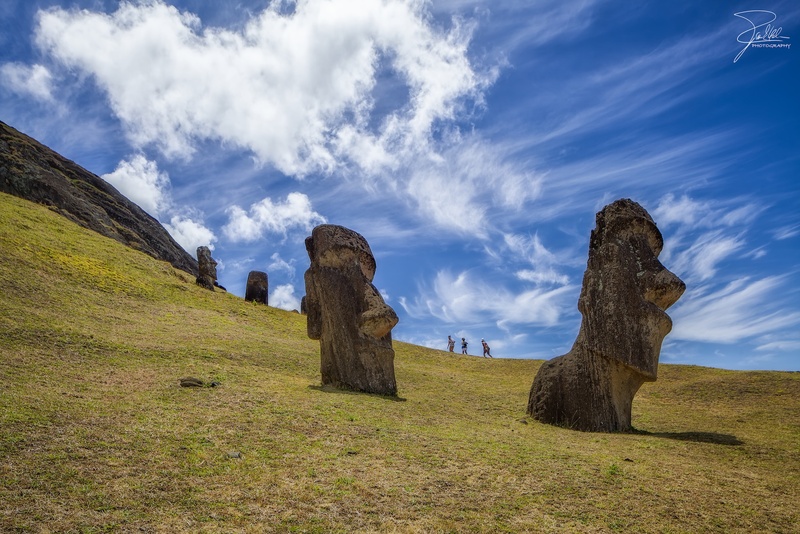 Rapa Nui National Park, which has some of the most fascinating and remarkable examples of cultural tradition in the world, includes well-preserved moai (stone monuments), ancient dwellings, and other sites of archaeological significance. Most of the island’s moai are within the boundaries in the national park and have protected status, so there are some restrictions for visitors which were put in place to preserve these sites. Today, Rapa Nui National Park is a protected UNESCO World Heritage Site that includes portions of the coastline as well as the more significant archaeological sites on the island. The artifacts within the park are highly authentic, with very little outside influence—beside the restoration of some of the toppled moai and the replacement of topknots—since the collapse of the indigenous civilization. 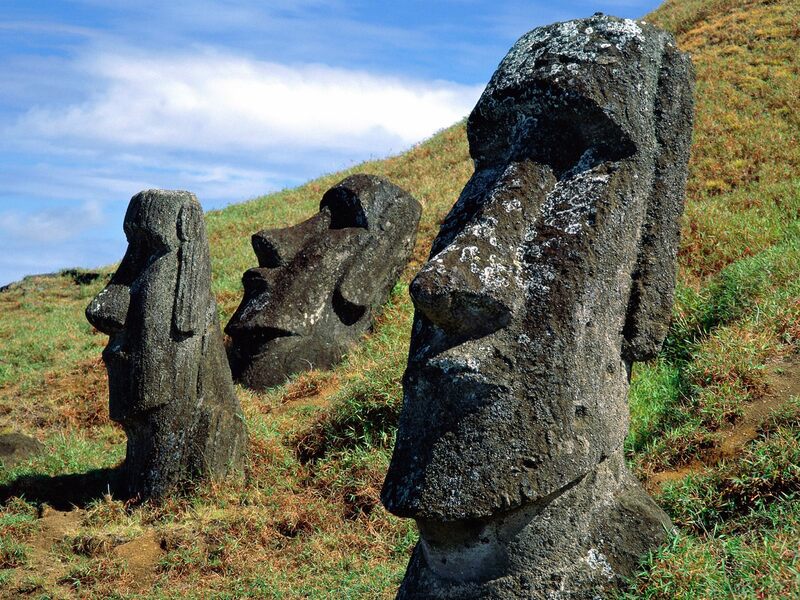 This authenticity respects the historical context of the sites, and in addition to showing the impact of civil wars and degradation by Europeans, also shows what the moai looked like during the height of the sculpting era. 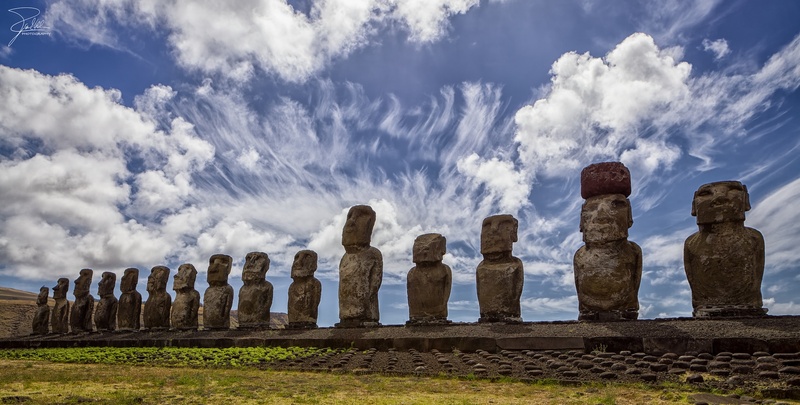 Rapa Nui National Park is administered by Chile’s national park service (CONAF) as well as the National Monument Council, which is responsible for the preservation of the country’s cultural and natural landmarks. 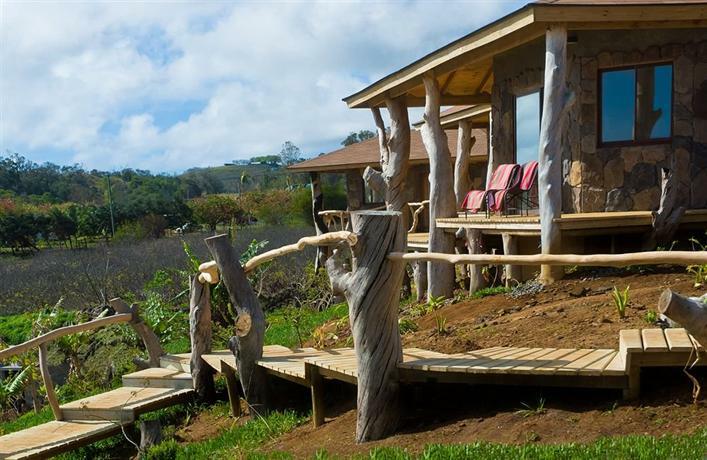 There are two areas of particular interest within Rapa Nui National Park, Rano Raraku and Orongo, both of which require a special park pass for entry. One of the most important sites in Rapa Nui National Park, the dormant volcano, Rano Raraku , is the birthplace of all the moai on the island. There are an estimated 400 moai at this site alone, with many of the moai still in the process of being carved from the rocky mountainside. From the parking area, you will first encounter the entry station, restrooms, an open-air educational exhibit, and a picnic area. 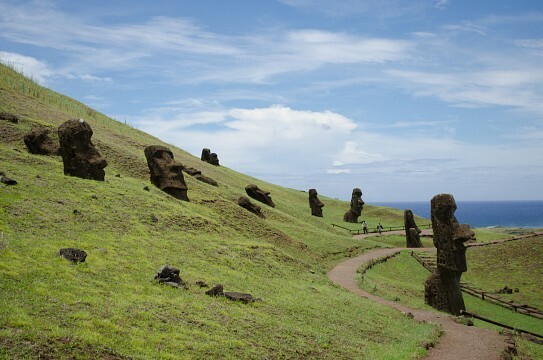 Follow the clearly marked paths along the grassy slope and between the moai on the hill. These are the moai that are often depicted in photos of Easter Island, buried up to their necks with the rest of their bodies buried in the earth after years of erosion. 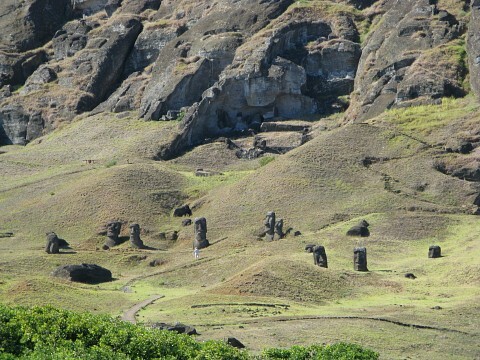 These moai were set along the hillside until members of a village would come to the Rano Raraku quarry in search of a monument to take back with them. In a sense, villagers would walk among the moai and “window shop” before making a selection. There are tremendous photo opportunities along this path, which takes you fairly close to the moai. From here, the path winds higher up along the hill in front of the nearly vertical rock walls. As you look up at the rocky alcoves above you, one will see what looks like naturally occurring bumps and crevices in the rock are actually indentations where moai had been carved from the mountain, leaving distinctly shaped impressions. 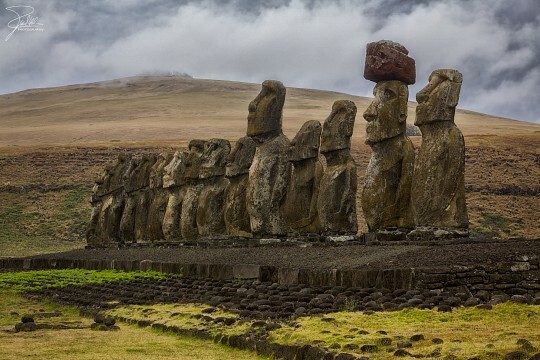 In other places, the moai are nearly completed and are connected to the surrounding rock only by a thin “keel” along their backs, which is the last part to be chiseled away before the statue is transported off the mountain. These remnants provide important clues about how these monoliths were manufactured and the sheer enormity of the project. Sculpting the moai was an extremely time-consuming and dangerous job, as workers only had access to rudimentary tools to slowly chisel the rock and then lower the 20-tons (or larger) behemoths down the mountain. When you are up close to the rock walls, it is easy to imagine the masterful skills needed to complete such a grueling task. The manner in which these moai were moved from Rano Raraku to their villages across the island remains a mystery. Some believe that they were rolled face-up on logs, while others believe that they were “walked” using ropes that rocked them forward. At the Rano Raraku site, moai that were en route to their final destinations litter the area, lying haphazardly in the grass on their backs, which suggests that an event—likely the outbreak of the civil war—caused an abrupt halt to the moai production. However, no logs or ropes were found lying around the abandoned moai, and there is no evidence of damage to the bottom of the moai which may have resulted due to the transportation methods used, so these theories about how the moai were transported remain inconclusive. 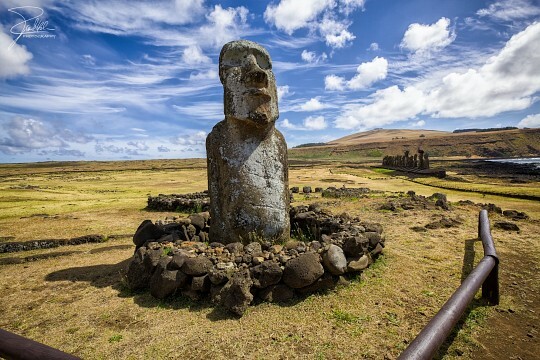 At this location, you will find extraordinary artifacts such as the largest moai that was ever carved—“El Gigante,” a staggering 72 feet tall and 180 tons—as well as the only moai that was depicted kneeling. A path also leads to the interior of the volcanic crater, where wild horses graze next to a small lake and more moai line the interior of the volcano’s rim. 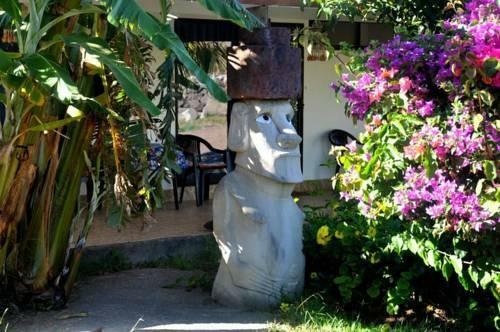 A fascinating piece of Easter Island’s history is the cryptic “birdman cult,” which spread throughout the island after the collapse of the statue-building cult. With environmental degradation and starvation threatening the survival of the island’s population, the islanders began worshiping Makemake (the God of fertility) out of desperation to survive. From these difficult conditions, the Birdman cult and a dangerous inter-tribal competition were born. At the ceremonial village of Orongo, located on the southwest edge of the Rano Kau crater, men from each tribe vying for leadership of the island would climb down the 1,000-foot-high cliffs to the ocean, where they would swim out to the small islands offshore in search of the first egg of the season. The first competitor to return with the egg intact was named the new leader of the year. It was a ritual demonstration of strength, bravery, and masculinity. 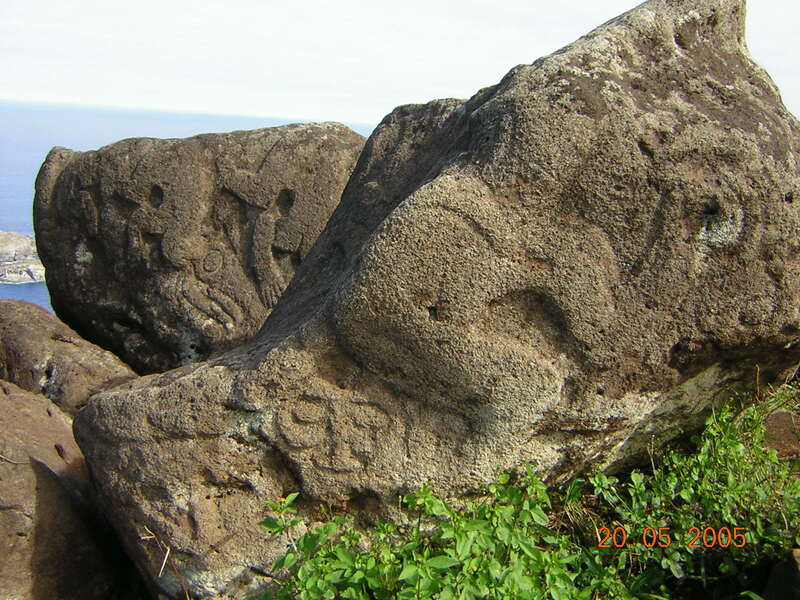 Hundreds of petroglyphs depicting the Birdman can be found here at Orongo, showing the incredible significance that the cult had over the culture of the island. Similar to the moai-building cult that preceded it, the Birdman cult entirely transformed this turbulent society. The Birdman symbol, which today is omnipresent on Easter Island, became the symbol of the warrior class and marked the transition from an era dominated by ancestor worship to one dominated by warfare. The village was eventually abandoned in the 1800s when many of the islanders were plagued by illness or enslaved by Europeans. Today, the village’s 54 stone slab houses are in remarkable condition, as are the basalt petroglyph carvings that are prevalent in the area. The ruins of Orongo are a short walk from the Rano Kau overlook. The path follows the knife-edge rim of the volcano, with a steep drop to the ocean on one side and the crater on the other. When you walk along the precipice, it is easy to see why the island’s most daring competition was held in this dramatic, hair-raising place. Once you pass through the entry station, follow the trail past the beautifully preserved huts, where the tribes would camp until the victor of the Birdman competition returned from the sea. 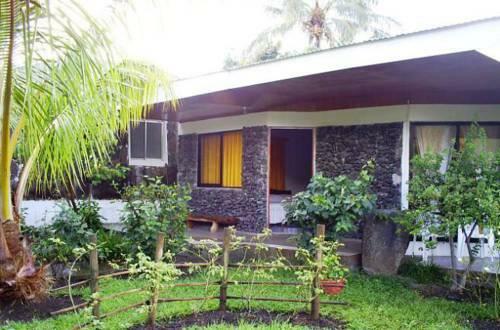 These are the best-preserved homes on the island and provide a glimpse into what life was like on the island beyond the moai. 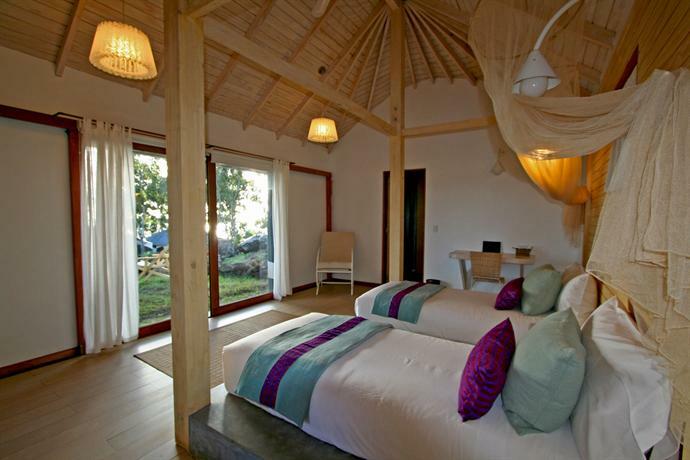 Rapa Nui National Park is open year round. While the most popular sites are accessible by vehicle or on foot, some of the more remote sites in the park that are away from the roads can only be accessed by horse. 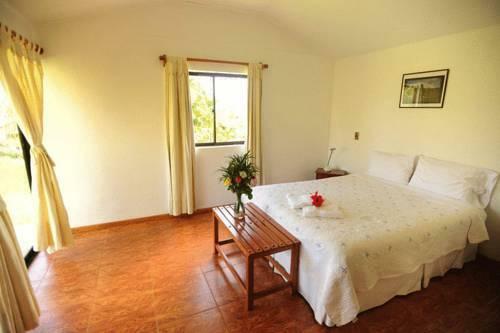 You should book a tour if you would like to visit these sites. 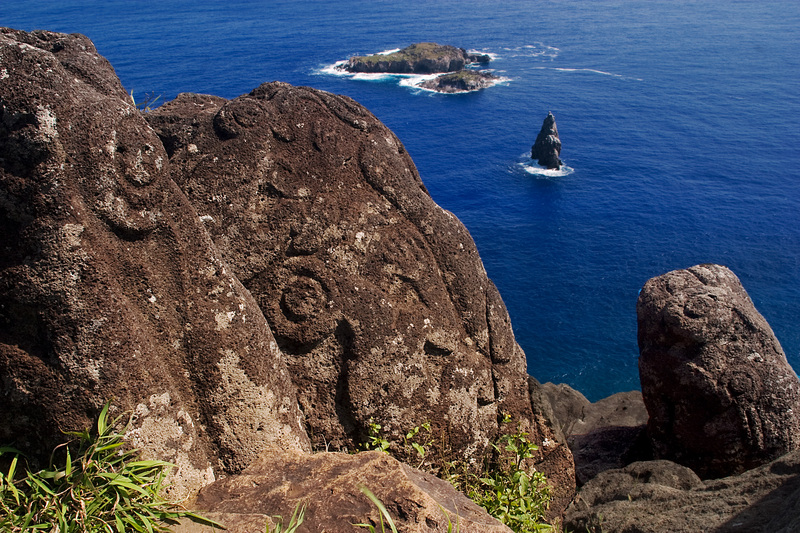 You do not need a guide to visit Rano Raraku or Orongo. Entrance passes for Rano Raraku and Orongo can be purchased at the airport or at the ticket office at each site for $63 (cash only) per person. The passes are good for five consecutive days and allow one-time entry to both locations. The ticket acts as a permit while exploring the island and also provides much-needed financial assistance for preservation and management at the sites. 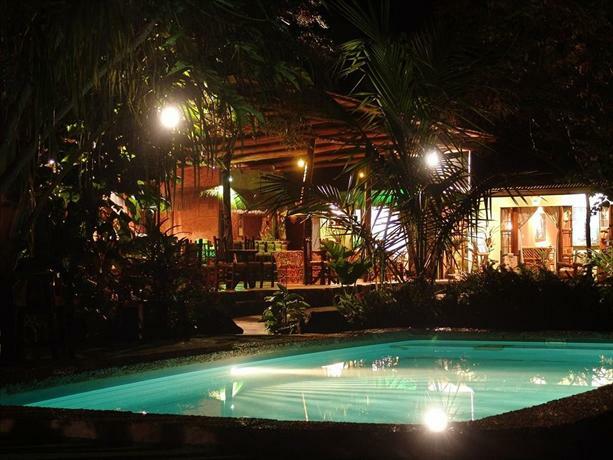 During the high season (December to March), temperatures on Easter Island are very mild, generally between 60°F and 80°F. These are also the sunnier months, though brief periods of rain can still occur at any time. The low season is also mild, with temperatures in the 60s, though there is more rain during these months. Keep in mind that because of the location of Orongo, this site can sometimes be very windy. Also, there is very little shade in most places in the national park, so wear sunscreen and a hat if possible. Backcountry camping within the national park is strictly prohibited; if you are interested in camping on the island, plan to stay in an established campground. These strict backcountry camping rules are in place out of respect for these sacred places as well as to preserve the archaeological sites. Also, never touch the moai or walk on the ahus (ceremonial platforms). It is extremely disrespectful and also harmful to the integrity of the structures. Be sure to have your park pass with you as you are visiting Orongo and Rano Raraku, because you will be expected to pay the full price of a second ticket if you do not have the pass with you.